Both overloading and the overriding concept are applied on methods in Java. Since polymorphism literally means taking multiple forms, So even though you have the name of the method same in the case of overloading and overriding, an actual method called can be any of those multiple methods with the same name. Let's see some more details on method overloading and overriding to understand how polymorphism relates to overloading and overriding and How they are different. Overriding is a form of polymorphism which is used in Java to dynamically bind method from the subclass in response to a method call from sub class object referenced by superclass type. Method overriding is bonded using dynamic binding in Java. Suppose you have two methods size() in both base class and derived class and Base class variable is pointing to an object which happens to be subclass object at runtime then method from subclass will be called, i.e. overridden method will be called. This allows to program for interface than implementation, a popular OOPS design principle because Polymorphism guarantees to invoke correct method based upon the object. Method overriding is key for much flexible design pattern in Java. See What is method overriding in Java and Rules of method Overriding for examples and more details. Method overloading is another form of Polymorphism though some people argue against that. In the case of overloading, you also got multiple methods with the same name but different method signature but a call to correct method is resolved at compile time using static binding in Java. Overloading is a compile time activity oppose to Overriding which is runtime activity. Because of this reason overloading is faster than method overriding in Java. Though beware with an overloaded method which creates conflict e.g. methods with only one parameter e.g. int and long etc. See What are method overloading in Java for example and complete details. 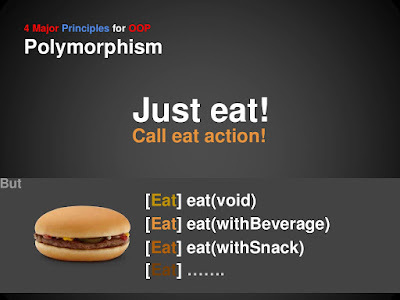 Let's see a short example of Polymorphism in Java. In this example, Pet variable behaves polymorphic because it can be either Cat or Dog. this is also an example of method overriding because makeSound() method is overridden in subclass Dog and Cat. In Summary, you can not compare Polymorphism with method overloading or override. 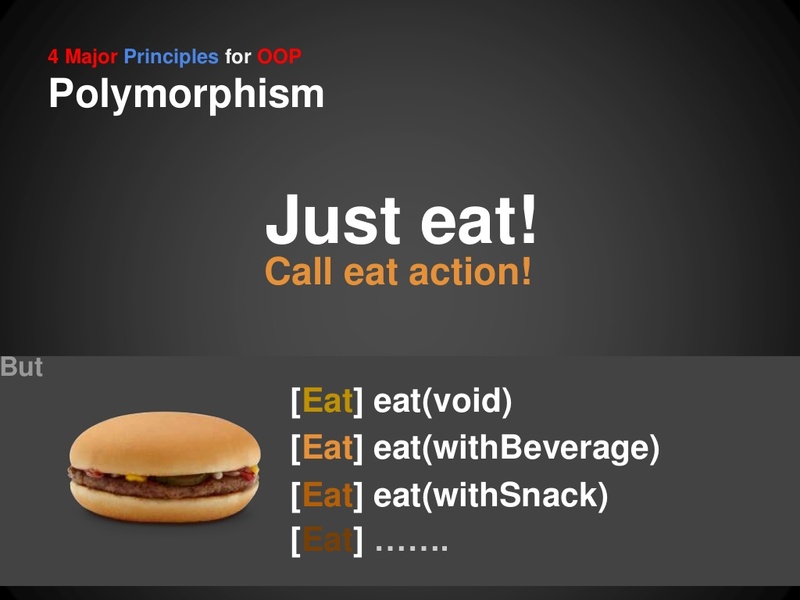 Polymorphism is the ability of a variable to behave differently based upon which kind of Object it is referring. They are Java programming language's way to implement polymorphism in language. Seems you are a C# programmer.